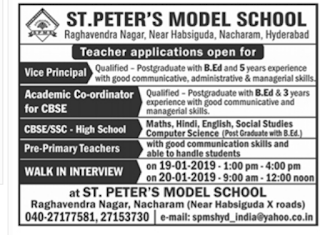 St.Peter's Model School,Hyderabad,has advertised for the recruitment of Teaching Faculty- Vice principal,Academic Co ordinators,pre primary teachers.Interested and eligible job aspirants are requested to walk in interview on 19-1-2019 & 20-1-2019. Check out further more details below. Name of the School: St.Peter's Model Schools, Hyderabad,Telangana. About School:GRD is a coeducational higher secondary school based on the matriculation syllabus. The medium of instruction is English. The school is nurtured by a team of dedicated Teachers and headed by its Secretary Mrs.Geetha Padamanaban. How to Apply: Walk-in interview on 19th January between 1p.m to 4p.m and 9a.m to 12 noon at school premises.